EX-DEMONSTRATOR - AUTOBIOGRAPHY - PAN ROOF - 22' TURBINE ALLOYS - DEPLOYABLE SDE STEPS!!! Finished In Santorini Black Metallic Paint With Full Black Oxford Leather Upholstery. An Ex-Demonstartor With Only 17,000 Miles and Full Land Rover Service History. This Autobiography Is Equipped With An Excellent Specification Which Includes: 22' Diamond Turned Alloys, Sliding Panoramic Roof, Electric Deployable Side Steps, LED Headlights with Signature DRL, 24-way Heated and Cooled, Massage Front Seats, Executive Class Rear Seats With Power Deployable Rear Centre Console, Suede Cloth Headlining, Four-Zone Climate Control, Surround Camera System, Grand Black Veneer Accents, Adaptive Cruise Control with Steering Assist, Bright Metal Pedals, Heated Steering, Rubber Mats and Remote Heating. Fully Detailed and Freshly Serviced By Land Rover Manchester. Please Call or Email To Discuss., 2 owners, 5 seats, FREE NATIONWIDE DELIVERY - 5.4% APR FINANCE AVAILABLE - 12 MONTHS WARRANTY!!! Finished In Metallic Santorini Black Paint With Full Black Leather Upholstery. 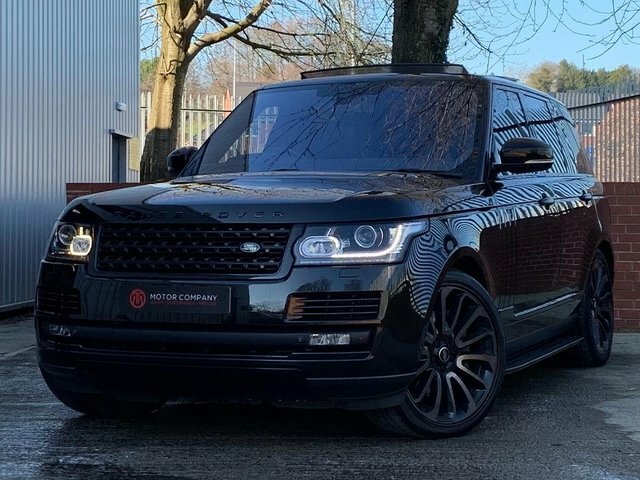 This Vehicle Can Not Be Described As Anything Less Than Exemplary With Over £20k Worth Of Option Extra's And Full Land Rover Main Dealer Service History. Optional Extras Include: 22' Turbine Style Alloy Wheels, Sliding Panoramic Roof incl. Power Blind, Wood/Leather Steering Wheel, Head Up Display, Rear Seat Entertainment System with 10' Screens, Black Pack, Meridian 1700Watt Signature Sound System, Fixed Side Steps, Privacy And Solar Accentuating Glass, Ambient Lighting, Xenon Headlights with Signature DRL, Adaptive Cruise Control with Queue Assist, Soft Close Doors, Front and Rear Parking System with Reversing Camera, DAB TV Tuner, Keyless Entry and Push Button Start, Heated And Cooled Front Seats With Heated Rear Seats, Massaging Front Seats. A Grade 1 Example Completely Unblemished. Please Contact Us For More information., 1 owner, 5 seats, FREE NATIONWIDE DELIVERY - 5.4% APR FINANCE AVAILABLE - 12 MONTHS WARRANTY!!! Large and powerful, the Range Rover sets the standard when it comes to refined 4x4 vehicles. The model's distinctive silhouette and bold contours will turn heads everywhere, while inside the cabin driver and passengers are treated to a refined and beautifully appointed interior. Spacious and versatile, the Range Rover comes exceptionally well equipped. Come and discover one of our quality used Range Rover models for sale in Congleton today. At TMT Website Account you can rest assured you'll only find the highest quality second-hand vehicles, all of which are rigorously tested prior to arriving on our forecourt. View the latest stock online and be sure to contact a member of the team with any questions. Finance is available to UK residents aged 18 years or older, subject to status. Terms & Conditions apply. Indemnities may be required. Other finance offers may be available but cannot be used in conjunction with this offer. We work with a number of carefully selected credit providers who may be able to offer you finance for your purchase, commission may be received. We are only able to offer finance products from these providers. Postal Address: TMT Website Account, Unit 1, Holland Business Park, Riverdane Road, Congleton, Cheshire CW12 1PN. Find contact details here.